visitnigI love the hud, but I was wondering what would I need to change personally if I want the health and ammo to be smaller? In order to lower the size of the health/ammo, you'll need to open up two files: HudAmmoWeapons and HudPlayerHealth respectively. Once they're open, all you'll have to do is rename the font that's in use. I believe I used "CerbeticaBold72" for both the ammo in clip as well as player health, but I also have it available so that you can easily change it to 64, 56, 36, 32, and a few smaller values you'd probably not want to even consider. Though I think Valve caps it at 64, so there probably won't be any different from 72 to 64. I think 48 might be a good size for you, but I don't have it defined for some reason.. If you'd like, I can update it real quick to include it, or you can define any size you'd like in ClientScheme.res. Anyways, once you have a size chosen, you have to rename the following entities in HudAmmoWeapons: AmmoInClip, AmmoInClipShadow, AmmoInReserve, AmmoInReserverShadow, AmmoNoClip, and AmmoNoClip shadow. Just remember that, unless you like it this way, you'll want to probably lower the ammo in reserve's font size too. In HudPlayerHealth, you'll edit PlayerStatusHealthValue and PlayerStatusHealthValueShadow. What exactly is wrong with it in 16:10, just the scoreboard? It might've been easier for me to just fix my current scoreboard, but I feel like have a different version for all 3 aspect ratios will work out better in the end. -It contains a 4:3 folder with both a 4:3-compatible scoreboard as well as tournament spectator hud. If you play on a 4:3 aspect ratio, just drag these files into your resource/ui folder and have them replace the initial files. -The main scoreboard should also now work with both 16:9 and 16:10 resolutions. -I also added in a new font size, to make shrinking ammo/health easier; "CerbeticaBold48" in ClientScheme.res. Hey rays the HUD is all awesome and stuff, though the 4:3 scoreboard seems a bit off. How can I move the stats a bit to the right? Same bug with tournament spec. Also could you help me with putting pulsing(hp) garm3n crosshairs in? I can put normal ones in, however there's a lot of fiddling with animated ones and HudPlayerHealth. Just updated to version 1.4 with a fix. Let me know if it works! Love you so much for the 16:10 fix! Hey Rays, I don't know if you remember me from your stream, but I was wondering how to make the HP cross on the screen full-time. Im a visual guy. Thanks! VoodooChowHey Rays, I don't know if you remember me from your stream, but I was wondering how to make the HP cross on the screen full-time. Im a visual guy. Thanks! Navigate to your tf/resource/ui folder. Navigate to "HudPlayerHealth.res" and open it up with notepad or any other text editor you have. From there, navigate down to "PlayerStatusHealthImage" and "PlayerStatusHealthImageBG", and change their x and y values from 9999 to 0. 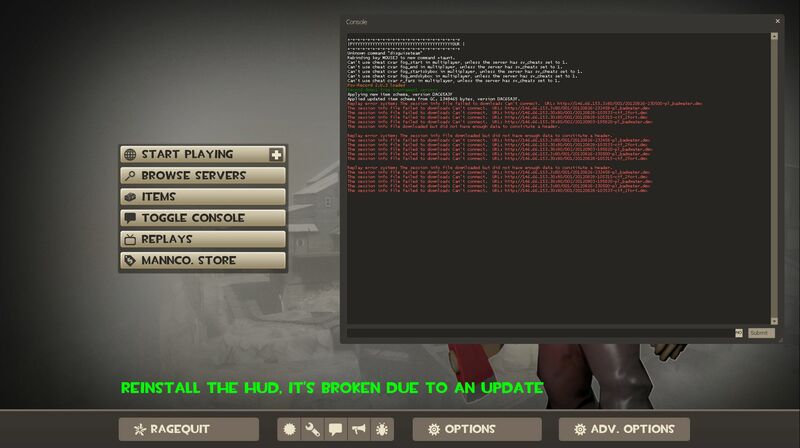 Then open up TF2 and join a server. The cross should be on screen, but not in the right spot. From there, you're able to adjust the x and y values to your liking, until the cross is where you want it. Just remember that in order to see it's new location after re-saving the file, you'll have to type "hud_reloadscheme" in console. If you want to adjust the size of the cross, just change it's width/height values. Remember to keep them the same, otherwise the cross will look stretched and out of proportion. Hey Rays, really love this hud! Before installing your hud i used the one pyyuur has, maybe there is a bad mix after installing. If you want to animate the crosshair in this hud open up hudanimations_tf in tf/scripts and find the event damagedplayer section. Then add the following to it. also does anyone have a nice class change menu to use with this? WithADanceNumberIf you want to animate the crosshair in this hud open up hudanimations_tf in tf/scripts and find the event damagedplayer section. Then add the following to it. Thanks dude but that's not what I meant :D This is easy, I have that already, I was talking about hp crosshairs: red when low hp, white when >50% and blue while overhealed. [quote=WithADanceNumber]If you want to animate the crosshair in this hud open up hudanimations_tf in tf/scripts and find the event damagedplayer section. Then add the following to it. lazybearHey Rays, really love this hud! Unless this warning is new, I'd imagine that it was put in by the maker of your previous hud, as I've never seen it before. You may have go back to the vanilla hud and then install rays. [quote=lazybear]Hey Rays, really love this hud! wecutourvisions is correct. It must've been left over from your last HUD, as no one else has said anything to me, and I don't get that error. Just try a clean install: Go back to the stock hud, then reinstall mine. Yeah can you please do that, I have no idea how to edit the correct values in clientscheme. Let me know if the sizes are okay! EDIT: If it isn't small enough, just tell me and I can make it smaller. -Fixed ammo clipping issue on some 4:3 resolutions. -Added in a new class selection menu. -Fixed a few positioning errors. -Added in a demoman head counter. To anyone that had previously been having issues with your class selection menu, this should fix it. -A new team selection menu. Awesome hud, thanks a bunch. One thing though, the advanced spectator hud appears to be broken for 16:10 (the health numbers for blu team are cut off of the left side of screen). Same for my teammates when I'm dead. Anyway it can be made compatible? Oh, and also the team select menu is off for 16:10. The S in "Select a team" hangs off of the left side of the screen. The class menu is fine. I'm on 1680x1050. I can provide screenshots if they'd help. frknAwesome hud, thanks a bunch. Oh right, I believe someone mentioned this to me the other day but I never got around to looking at it.. Let me take a look at it, and I should get a fix out in an hour or so. [quote=frkn]Awesome hud, thanks a bunch. -A fixed tournament spectator hud for 16:10 resolutions. Note: With this update, the tournament spectator hud now has one team's info on the left side of the screen, and the other on the right; much like the 4:3 tournament spectator hud. If you enjoyed having them side by side, then just download a version of the hud prior to 1.7 and put the file "SpectatorTournament.res" into your resource/ui folder. how can i choose/edit the special xhairs? rookshow can i choose/edit the special xhairs? I haven't added any just yet, besides my circle crosshair. You can enable that by opening up hudlayout.res in your tf/scripts folder and changing the values of "enabled" and "visible" from 0 to 1 in the very top section titled "xHairCircle". I'll be adding in more crosshairs soon, but if there's a specific one that you want from another hud and you don't want to wait for me to release my own, here's a guide I made on transferring crosshairs between huds: https://dl.dropbox.com/u/19762650/importingxhairstf2.jpg . -Fixed hud elements in a few places. -Lowered chat down to not overlay with engineer buildings. -Ability to quickly shrink health/ammo size. In order to shrink your health/ammo, find the files "HudAmmoWeapons-minmode", "HudPlayerHealth-minmode", and "HudMedicCharge-minmode" and rename them without the "-minmode" suffix, and have them overwrite the previous larger health/ammo files. Also, sorry about the incessant updates. :< I just keep finding things wrong with it, and am trying to perfect it as much as I possibly can.